AV Installs Professional Home Projector Service gives reassurance that the projector is installed securely and configured correctly by our own in house audio visual installation engineers. This service is suitable for all makes and models including DLP, LCD, OLED and 3D projectors. AV Installs engineer will advise on the best possible mounting position and provide the correct specialist fixings required providing a secure projector mounting regardless of the units size or weight. After all the equipment is connected and the projector is optimised the engineer will run through how to operate the projector along with your existing home entertainment equipment. If customers have any operational or technical question our engineers are very helpful don’t be scared to ask. 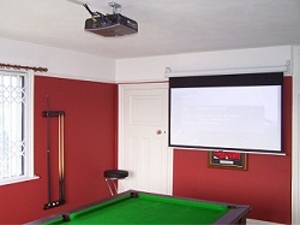 The home projector installation service is fixed price subject to a brief free of charge telephone job assesment. AV Installs will then email over an official quote for the works discussed along with our terms and conditions. All work is covered by a full twelve month warranty along with a customer satisfaction sign off form.AV Installs is a Northamptonshire Trading Standards Approved Buy With Confidence Member and only uses its own engineers which are CRB checked.